If you are a digital marketer and know how to properly set-up and monitor a PPC campaign, you will likely be rewarded with all sorts of treats in regards to the high quality web traffic coming to your website. While the treats may not be as delicious as Candy Corn or M&M’s, they are still pretty darn great. When there is a large budget associated with a PPC account, small mistakes can be more costly than a lackluster outfit to a Halloween party! Don’t get tricked into the common mistakes often made with PPC campaigns. Follow our special Halloween guideline to ensure that you don’t fall into any of the scary PPC mistakes that we often see. For certain campaigns with relatively small search traffic, broad match keywords can be the correct approach. According to Google, when you use broad match keywords, your ads automatically run on relevant variations of your keywords, even if these terms aren’t in your keyword lists. If you have a limited budget and a high search volume on your list of keywords, this can result in low quality traffic coming to your site from the PPC campaign with a high bounce rate and low time on site. This can be just as bad as the house that gives out apples instead of candy! Let’s take a dental practice in Dayton (they might be the only ones who prefer the apple). If they were to run a campaign using broad match keywords, someone could click on their advertisement when searching for the keyword variation “Dentistry School in Dayton” when there broad match keyword was classified as “Dentist in Dayton.” Clearly, this would result in low quality traffic. It is important to examine all of your keywords to make sure you are selecting properly between broad match, phrase match and broad match modifier. 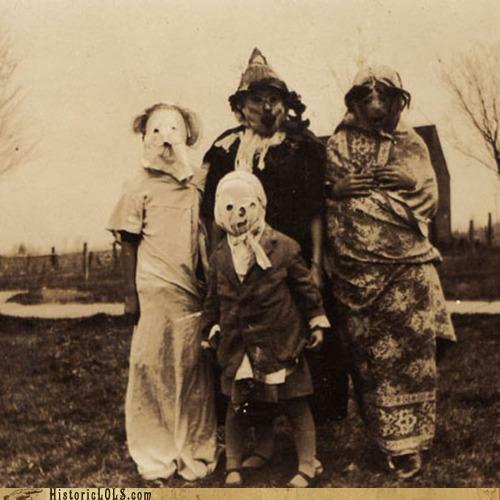 One of the most common mistakes that we see (which is scarier than these Halloween costumes from the 1940s) is when conversion tracking isn’t installed properly. Conversion tracking is the source of truth for how many people filled out contact forms, purchased a product or made a phone call from your paid advertisements. Without having conversion tracking properly set-up, there is no real way to gauge the success of your PPC campaign. The apartment community, Orchard of Landen, is able to gauge which keyword leads to the most conversions by having conversion tracking installed. They also have a dynamic phone number set-up on their website to determine the amount of phone calls that come into their rental community from a PPC campaign. Make sure you are utilizing conversion tracking so you can analyze the date, make improvements and master your PPC campaign! Paid advertising might be one of the few industries where online marketers are not spooked out by big data. Linking analytics and Adwords will take conversion tracking to another level. It is essential that Google Analytics and Google Adwords are synced together. So many marketing decisions can be determined seeing the different pages someone visits throughout your site after initially coming to your landing page or their average time on site. The process for linking Analytics and Adwords is about as easy as eating in a Reese’s peanut butter cup in under 30 seconds. When there is a broken link on your website, this can still eat up your PPC budget while not driving any worthwhile traffic to your website. When this happens, you are throwing money down the drain. Dead may be a pretty cool buzzword around Halloween, but not when it comes to links. If you get caught with a PPC campaign sending a large amount of traffic to a broken link, you might want to look for a relocation company to help get you out of dodge! Constantly check all of your links within your PPC campaign so that they are active and they match the correct marketing message that will align with your ad copy and keywords. Shoemoney.com provides great tips on ensuring you never send paid traffic to a 404 pages or broken link. According to andersanalytics.com, average bounce rates for most sites typically fall in the 40%-60% range. This means that 1 out of 2 people will immediately drop off of your landing page after coming in through a PPC campaign. Imagine if you are in an expensive industry like personal injury, this can mean that you paying close to $70 per click when someone leaves your site immediately! By installing a re-marketing pixel on the backend of your website, you can have display advertisements follow the user around the web for a specified timeframe. This will help keep your brand top of mind and convert on the very expensive traffic that you bring in through PPC. Imagine if you are a pizza company and someone drops off of your website without ever coming into the restaurant. Once they constantly see your display advertisements, people will be more inclined to stop in and eat! If you don’t have re-marketing pixels installed and a strategy in place, you are missing out big time! Don’t let PPC advertising spook you out. Make sure you have your bases covered by implementing the 5 essentials mentioned above and you will be bragging to your friends about your new customers, just as kids would brag about their Halloween candy. Happy Halloween from The Media Captain and Acquisio!